You mostly see the skippers of centre consoles standing up to drive, and the designer of the Tattoo centre consoles presumably made a note of that because the 550 I was in had no seat. That’s not the whole truth: there is a wide bolster, a sort of padded leaning aid that you can actually sit on with your feet on the console’s shelf. But you can choose to lift it out of its sockets and drop it into other sockets close ahead of the console; or even leave it at home. The idea is you have no seats permanently taking up room. That sort of fishing practicality is this boat’s keynote. There is no carpet over the self-draining chequerplate aluminium deck, which means you will need shoes in summer but also means easy wash downs. All around the boat’s perimeter there is plenty of room for toes when the thighs are snug against coaming or transom. The T-top supports are mounted on the console so there is no obstacle to passage anywhere. The supports are of generous section and as near totally rigid as they could get – reassuring hang-on points. In fact rigidity generally features strongly in the Tattoo: the wide coamings or side decks greatly stiffen the topsides. 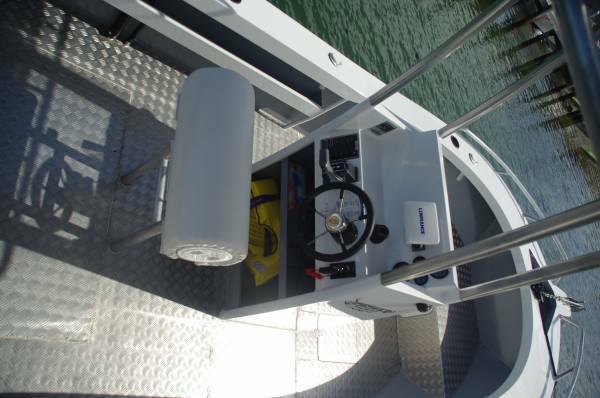 The console has an open rear rather than a door and this makes sense: apart from allowing the shelf to be used as a foot rest, it allows quick access to the likely stowage for life jackets. 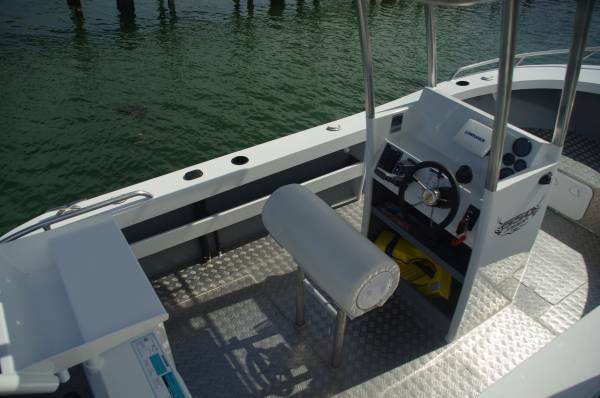 The console’s upper face has enough clear area to mount two 12-inch monitors, all the engine gauges, switches and the like being mounted at a lower level. Ahead of the console the deck takes a step upwards. 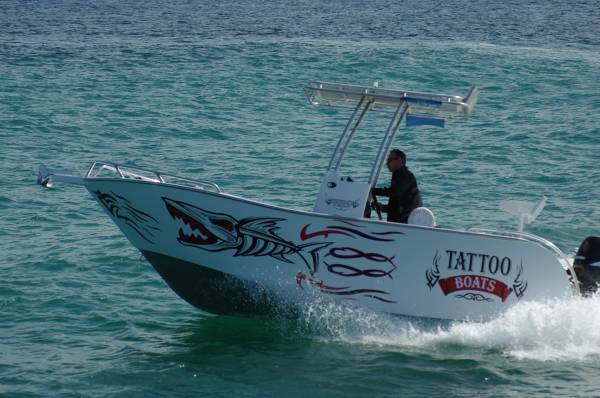 Casting platforms have their fans, and the Tattoos take account of this – you can opt to have the stepped-up deck extend aft as much or as little as you wish. The step itself has a door in it, making the under deck space into a vast locker. Aft of it the main deck has a hatch covering a catch tank. Removing a bung makes it free flooding for ballasting down, and venturi action once moving again drains it. Not that you will have any pressing need to stiffen up the boat for fishing. At rest it feels well glued to the water, and the vigorous movement of the two available men did little to disturb it. Leaning on the bolster proved a very comfortable way to travel, and it is wide enough for a second person on friendly terms with the driver to squeeze in alongside. A curiosity of this individual boat was that it was set up by request for a left hander: throttle lever to port instead of starboard. After half a lifetime or more of right-handed control of speed and direction I found it needed surprisingly amounts of deliberation for the first few parking manoeuvres. The motor the lever controlled was a 90hp four-stroke Suzuki. With the light load on board it was enough to make the boat jump away from a standing start and deliver more than enough speed for any likely use on the ocean. 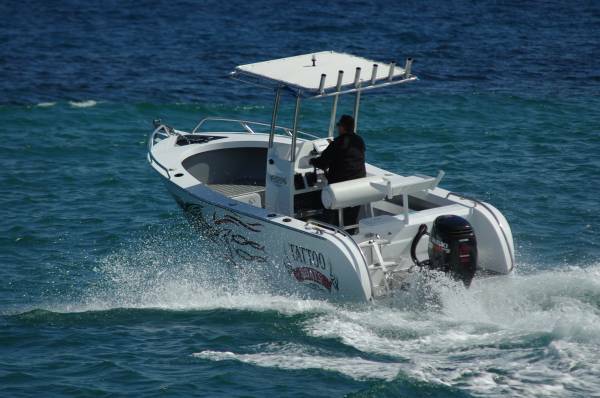 Bearing in mind that the boat would happily fish four, and would also make a fine diving platform for even more, 90hp would be just about right to cover all occasions. Anybody getting out of the water will declare the ladder a beauty: massive in structure, well raked, and with big area treads. It is long too, and this fits it for people boarding when on the trailer; plenty of ladders call for painfully high stepping. Considering the clear decks and general streamlining the 550 is well fitted out. Storage is fitted in wherever it fits: the bolster has opening ends to fit small items inside; there are side pockets for half the length; the transom houses a large locker and a deep bait tank. The transom also carries the removable bait board with a pair of rod sockets on it for good measure (there are four more in the coamings and six on the T-top). 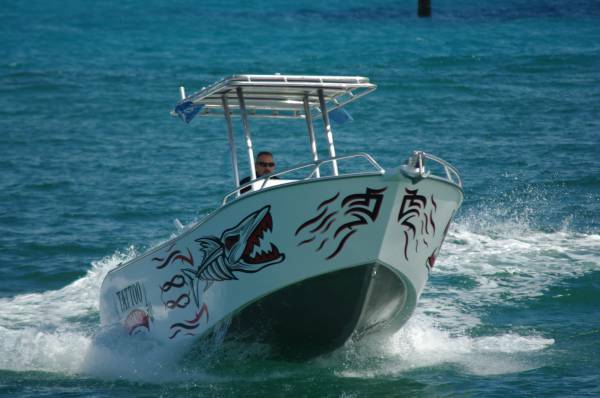 Here is a dedicated fishing or diving boat. Not terribly family friendly – the lack of a toilet or anywhere to put one alone would ensure that – but it serves the intended purposes well.